Before it's too late, learn how to best support your school. 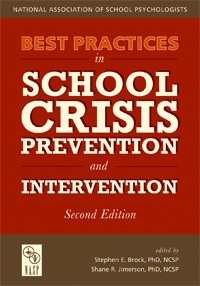 The completely revised second edition of Best Practices in School Crisis Prevention and Intervention contains all the information necessary for analyzing all aspects of school crisis. Explore the 37 chapters for an in-depth look at specific types of crisis, individual and school-wide interventions, and long-term supports to help students and the community heal. Be familiar with the tools to handle crisis prevention and intervention. Whether you're a school psychologist, counselor, teacher, administrator, or other educator, keep your school safe by adding this staple to your bookshelf!